You can find a complete 2013 Mazda CX-9 review below the video. Don't stress out over your next purchase; look to the stellar Mazda dealership in Springfield for thoroughly researched reviews written by industry specialists. This article will tell you exactly what you're looking for. 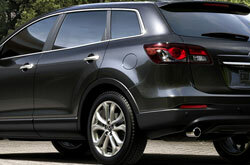 As your Springfield Mazda dealership, you can trust on us for distinct information on the 2013 Mazda CX-9. Get started by reading the full review or watching the video. Compare the 2013 Mazda CX-9 alongside vehicles like the 2013 Ford Edge, Dodge Durango and the Chevy Traverse, and you'll see that the CX-9 ranks above the competition in various areas. View our Quick List below to find out why! Reliable Mazda's car repair men have served Springfield for years with spectacular workmanship and authentic Mazda parts. Mazdas in Springfield can take a pummeling, so turn to the auto repair buffs in Springfield - Reliable Mazda. We handle big, intricate repairs like shock and strut repair, as well as easy endeavors such as customary oil changes, tire rotation and replacement and a diverse set of supplementary services. Reliable Mazda is your clear winner in Springfield for quick, professional Mazda service and regularly scheduled maintenance. The subsequent link is your road to ridiculous savings. Click now to be lead to to Reliable Mazda's specials.